Insects becoming immune from certain types of pesticide. The differences seen in humans from different geographical regions. For more see: http://evolution.berkeley.edu/evosite/evo101/IVB1aExamples.shtml. An extremely well put together site that gives you a basic tutorial on evolutionary biology! John was objecting to the "Bacterial Resistance to Antibiotics" example by stating that even though the bacteria was resistant to antibiotics, they were still bacteria and he didn't see any resemblance of evolution in this. I can only say that I think John doesn't grasp the concept of what microevolution actually is. 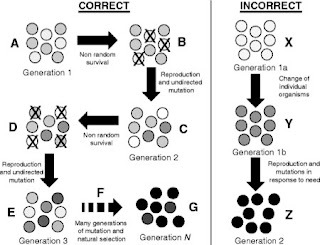 Over a relatively small amount of generations (microevolution), there will be differences within a specie, even if a new organism isn't created. The accumulation of many, many changes (the same processes that drive microevolution) yield speciation, becoming a new specie that cannot breed with their ancestors. This lengthy process is referred to by creationists as macroevolution. Scientists, however, rarely distinguish between microevolution and macroevolution, as the same processes drive both and the scope of time is the only major difference. I am entertaining the ideas of macroevolution and microevolution for the creationists sake, even though the distinction is somewhat redundant. Macroevolution is the part of evolutionary theory that Christians reject most often. Young Earth creationists believe in a 6,000 year old Earth (calculated from dates and ages of generation found in the Bible). The idea is that we "know" when Jesus died and we "know" his age. The list of the linage from King David to Jesus is found in the Bible along with the linage from Adam and Eve to King David. Ages of most generations are provided by the Bible, so theoretically we could calculate the age of the Earth. This number comes out to be around 4,000 B.C.E., sometime after the domestication of the dog. I wager that one can see the problem a "young Earther" may have if scientists are saying that branches of the evolutionary tree can be traced back millions of years. 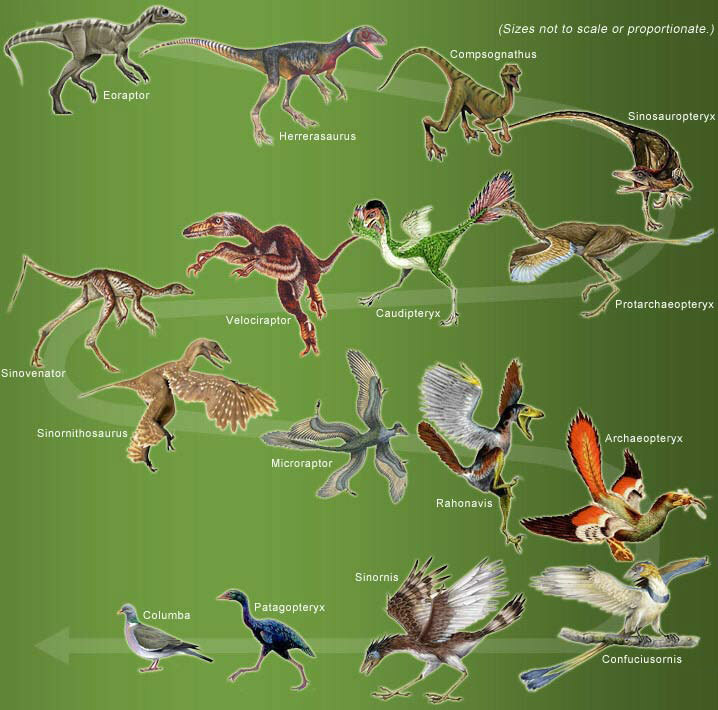 Macroevolution accounts for all of the diversity of life we observe today. The evidence lays in the fossil records, DNA analysis, phylogenetic analysis, and a handful of macroevolution observances by scientists in our lifetime (even though creationists believe none exist, see http://www.talkorigins.org/faqs/faq-speciation.html#part5). All of these topics can be explored further at http://www.talkorigins.org/! Back to John. John was trying to make the claim that he has never seen a reptile give birth to a bird, he "knows" scientists (along with the theory of evolution) say that birds come from reptiles, therefore the scientists are wrong and he doesn't believe in evolution. Many things are wrong with this argument, but let me focus on two: his claim that scientists say birds come from reptiles and he has never seen a reptile give birth to a bird. Scientists say birds come from reptiles. 2. I have never seen a reptile give birth to a bird. If anyone saw this happen, this would be a strong bit of evidence against evolution because the theory of evolution doesn't actually say this. As I explained above, not only is the distinction between reptiles and birds (at their transitional phases) hard to pinpoint, the fact this process takes millions of years refutes this argument. As I have said earlier, scientists don't see the need to differentiate between macro- and microevolution because they are guided by the same processes. You might be wondering what these processes are, so I'll conclude this post with a brief and extremely simple explanation. Let us assume that this population of circles is put into an environment where being darker in beneficial (whether the predators can see lighter prey more easily, darker circles are chosen more often by female circles as mates, darker circles can survive hotter conditions, etc.). If one or more of the circles develops a mutation that makes their body a darker shade, these darker circles are more likely to survive and therefore more likely to breed. This is where the phrase "survival of the fittest" is coined from. Over a long period of time, the entire population will be consisted of dark circles given that their environment remains constant because the darker circles will be the ones passing their traits to their offspring (one of which may have a mutation to be even darker). The incorrect side shows a misconception about evolution similar to the "reptiles give birth to birds" fallacy. Mutation do not respond to the environment; they are completely random. Therefore each circle won't spontaneously give birth to a darker circle. For more information, I highly recommend this article: http://atheism.about.com/od/evolutionexplained/a/micro_macro.htm. The article is extremely brief and describes where the terms microevolution and macroevolution come from and how both creationists and scientists use them. I understand that this is a lot to take in if you have little background in biology, however the information is easily available on the internet and it is explained much better than I have tried to. I am not a scientist by any stretch of the imagination, however the concepts aren't too difficult to understand even for me! If anyone out there is an evolutionary biologist or has any expertise in the field and believes I have totally misrepresented science, please leave me a comment below telling me how wrong and unintelligent I am and correct me. This way there is no way I'll mess this up again! As always, feel free to e-mail me at brbailey@umd.edu to give comments, ask questions, start up a discussion, tell me what a stupid, "spawn of the devil" heathen I am that deserves to burn in hell for all eternity, or anything else you would like! I'll happily answer any e-mail! Have a great day!